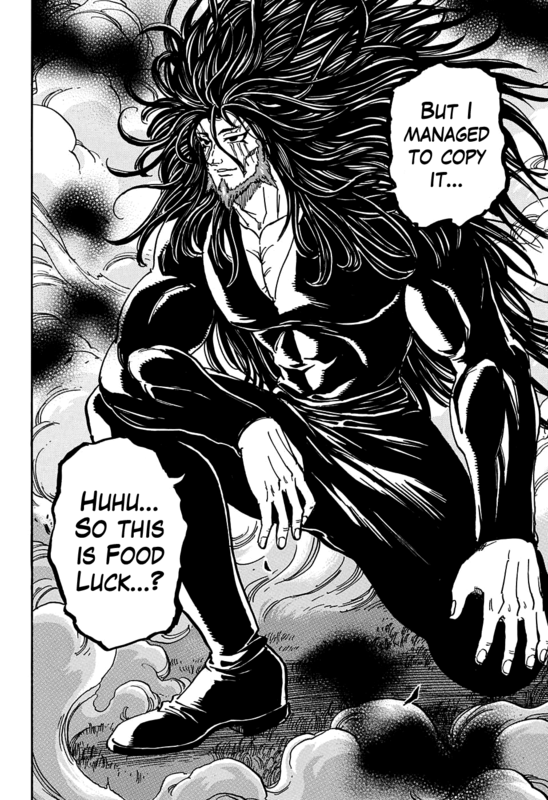 Midora (三虎 (ミドラ)) is the leader of the Gourmet Corp. and the main antagonist of Toriko's Human World Act. He is simply referred to as "Boss" by many of the organization's members. Midora, in the past was trained by the legendary God "Acacia as his third disciple, having been preceded by the IGO president Ichiryu and the famed "Knocking Master" Jiro. All three disciples were also the adopted children of both Acacia and "Chef Goddess" Froese. With the death of his older brother Ichiryu, he is currently the strongest man in the world. Midora's birth and childhood were filled with much grief and hardships, but upon being taken in by his adoptive family he had found true peace, however that all came to an end after the traumatic loss of his mother which greatly altered his views and made him believe that the world did not deserve Froese's charity and kindness. Thus he founded the Gourmet Corp. and currently directs it towards finding Acacia's main dish, GOD in the Gourmet World in hopes of using it to take control of the world's food supply and deprive the world he regarded as cruel and selfish from the blessings of food given to them by Acacia and Froese, believing they do not deserve what they have taken for granted. 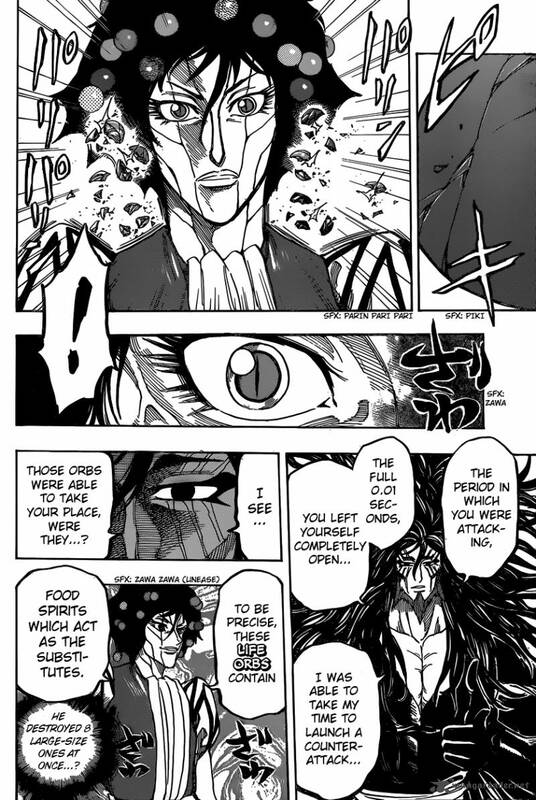 After the events of the Cooking Festival Arc, Toriko meets Midora, in which they form an agreement of mutual interest. Since then, Midora has become a core ally of Toriko and company, even going as far as sending the strongest members of his organization to help the Four Heavenly Kings capture Acacia's full course and defeat NEO. Gourmet Cells: Specialized cells with excellent regenerative and strength-enhancing qualities. When a human successfully adapts Gourmet Cells into their body they gain overwhelming life force and strength, creating a super human. An individual's Gourmet Cells increase in power when they consume delicious foods that suit them and the 'tastes' of their gourmet cells, causing the cells to 'evolve'; this enhances the strength of the user and their abilities. Gourmet cells can also evolve as a response to harsh new environments, instantly creating adaptations which allow the user to survive. Gourmet Cells have very high energy demands, so individuals must consume frequent large amounts of delicious food, lest the cells begin uncontrollably devouring their body at the cellular level. Essential Oil: A volatile substance that is emitted by trees, shrubs etc, that has a function as an insecticide for insects. 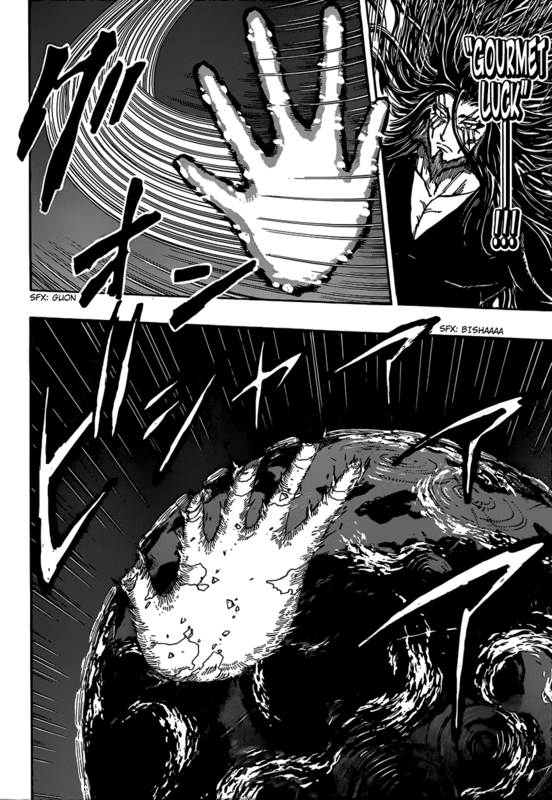 Regeneration: In recent chapters, it has been shown that when Toriko's body is heavily damaged, if there is quality, well prepared food in his system, any damage to his body will be reversed by his Gourmet Cells. This can be anything from deep gashes to damaged internal organs. However, Midora takes this much further. Midora is noted by Joa to have incredible regeneration capability and speed, being completely unfazed after being slashed into countless pieces and having parts of his head and chest blown off. His regeneration-speed could actually keep pace with the speed of barrages of attacks from Joa, a FTL character. Joa stated that this regeneration-speed makes Midora "practically invincible." Midora can heighten his regeneration even further with Minority World, making his regeneration near-instantaneous and allowing him to return to peak strength after his body began to melt due to the fungus implanted within him. High Efficiency Breathing: By preserving as much oxygen as possible in his lungs, Midora's Gourmet Cells significantly lower the total amount of oxygen needed to function, as well as lowering the total amount of oxygen expelled with each breath, thus stabilizing the blood oxygen levels in his arteries. The result is high energy levels brought from a comparatively smaller amount of oxygen, high efficiency breathing. Exhalation is also stopped, which keeps body heat, moisture, and oxygen inside his body, and any carbon dioxide that is contained inside by not exhaling is expelled in an instant, while any stored oxygen is immediately sucked back in. Anti Gravity Cell Vibration: Midora's Gourmet Cells vibrate against each other to generate a large amount of static electricity, to a similar magnetic charge of a high gravity environment. What would normally be a negative charge that's held in his body, is slowly changed to a more positive charge. The result is a positive charge standing against a positive charge, which increases the repulsive force in his body, making the effects of high gravity less pronounced. This however, consumes a high amount of calories. Hungry Tongue: Midora can control the length, size, direction and form of his tongue, which he uses as a whip to consume his target as well as a weapon to assault his opponent(s). It's potent enough to consume atoms around the 'space' it touches, even air, creating invisible rifts of void. Hungry Space: After making "invisible rifts of void" with his Hungry Tongue, Midora fills the void with his voracious Appetite Energy, creating a "Hungry Space" which consumes anything that touches it on an atomic level (thus causing any power that manipulates atoms, such as Minority World, to be rendered useless). When something touches "Hungry Space", Midora learns the taste of it and can then direct the rifts of hunger directly onto his target to eat and consume them. His Hungry Space can also operate as a sort of shield around him, as anyone who may attempt to attack him after the former had activated Hungry Space would be consumed in the process. Tongue of Thorns: Midora multiplies and changes the shape of his tongue, which gains an appearance of thorned whips. He can use it to attack from multiple angles. Tongue Shield: Midora uses one of his tongues as a makeshift shield by spinning it rapidly enough to make it seem like a shield. Mountain Tongue: Midora enlarges his tongue to a huge size and uses it as a flail to counter incoming attacks and smash the opponent with its tip to the ground. Machine Gun Tongue: Midora releases a branch of innumerable tongues from his mouth that have a widespread range of attack. Meteor Spice: After manifesting his Gourmet Cells like a Stand, Midora launches a torrent of "spice", "meteors" made of Appetite Energy", from its mouth which rains down upon the target area (it affected the whole of Human World in Toriko). Meteor Burst: Midora releases a burst of Appetite Energy from his mouth. It is capable of launching an opponent into space. Meteor Laser: Midora manifests his appetite demon, where he then has it fire a barrage of appetite energy laser beams at the target. This move was powerful enough to drive back Acacia's Gourmet Hand, of where he made one that was size larger than the Earth itself. Hungry Blow: A punch powerful enough to cause an explosion when the target hits the ground. Mirror Neurons: Midora is capable of understanding the mechanics behind someone's techniques to learn, counter, or exploit them. His form of imitation is by far the most complex as he can imitate not only the very nature of an opponent's ability but also the very nature around him, allowing him to blend into the environment as if he were a part of it. This ability has allowed him to see through and copy the mechanics of Ichiryuu's Minority World and Joa's Food Luck. Minority World: Midora is later revealed to be able to use Ichiryuu's signature ability, allowing him to control atoms that defy the natural laws governing matter and impose it on his environment. Upon activation he very nearly killed Joa, who was only saved from total annihilation by Froese's Gourmet Luck. The usage of Minority World can also elevate Midora's regeneration-speed to become instantaneous, and allows him to instantly destroy pathogens (such as Joa's microbes) within his body. Food Luck: Belief of the fortune one can have with ingredients and their daily lives, such as the chances of finding rare ingredients, surviving against nature, or the luck one can have succeeding at a food related event. Note: Midora's Void Manipulation isn't actual Existence Erasure, rather it's a space void of air (aka vacuum) which disintegrates anything that enters its range on an atomic level.